4 1/4 in / 10.80cm closed; 3.3 oz. This lightweight everyday carry knife has an open frame that is the ultimate in minimalist design. Easy to clean, carry, and open, the Paraframe is an effortless addition to your pocket or belt clip. Available in multiple blade variations, this knife handles it all. Built just as tough as the Gator Machete, the junoir is shorter and more packable. The two sided blade has both a fine edge for hacking brush and vines and a rough cut saw edge for cutting branches, limbs and small trees. This standard-duty multipurpose knife is part of the X OLFA Design Series (TM), a powerful line of anti-slip grip cutting tools combining exceptional performance with innovation. Features an automatic blade lock, cushion grip for maximum comfort and control. Synthetic Line Hawkbill Double-Dyed Synthetic series, this rugged synthetic handle is carefully jigged and double-dyed to achieve a classic look with modern characteristics. 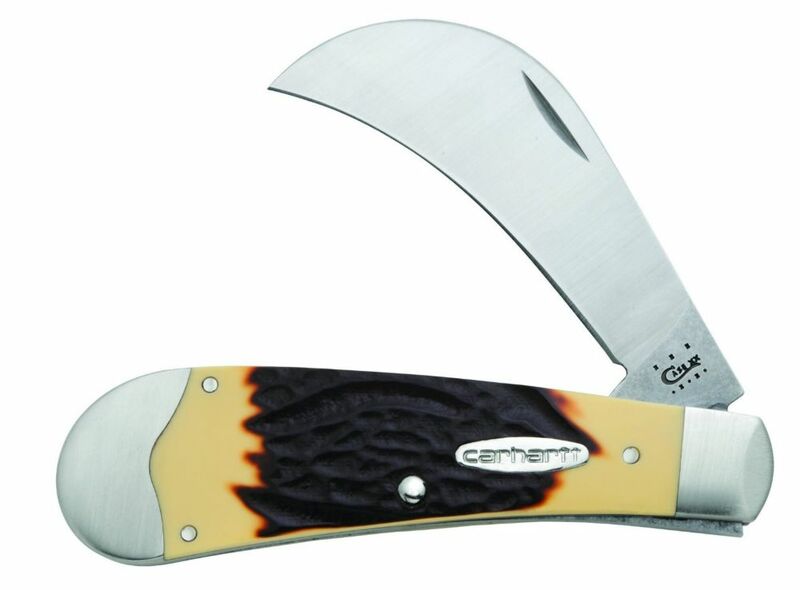 These knives feature strong shoulder and satin finish, brushed finish Lazy Duck bolster, special double-dyed synthetic handles and nickel silver Carhartt shield. Case artisans still hand-craft each knife the way they have for 124 years. They put a lot of time and effort into making sure the knives they produce today reflect on their history in positive way - the finest steel blades, nickel silver bolsters, covers that are pinned, not glued like lesser grade knives, and a limited lifetime warranty. All this and the pride of being made exclusively in the USA stands behind each knife.